Good morning! We hope all of you had a fabulous holiday weekend. It hurts to be going back to work today, but ya gotta do what ya gotta do. To cheer this morning and short week up a bit, we are thinking about flirty florals. Bright. Loud. Funky. Flowers. Yes, yes ya'll. Obviously this is the time of the year where flowers are in full bloom, ahem...my allergies can attest to this. Summer is full of bright punchy colors and fun and funky floral prints. Florals are typically more feminine, however, adding a one or a few floral elements to a room can give it balance and not an overwhelming "girly" feel. We have compiled a grouping of all things floral and hope that you all enjoy it just as much as we do. 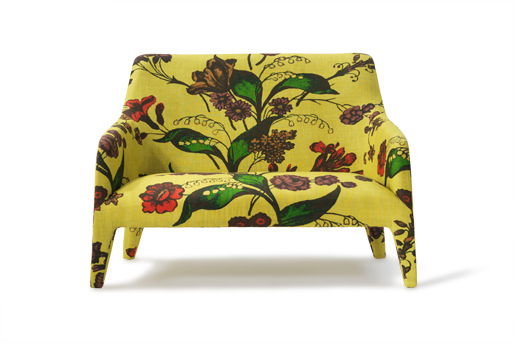 We would love to just chill on this floral settee. Maybe drink a spot of tea? This would be the perfect addition to a room that has a lot of solid colors. One would walk around the corner and see this and immediately think, "BAM!" 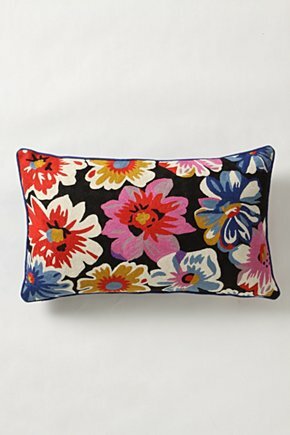 Love the enormous floral graphic on this Trina Turk pillow. 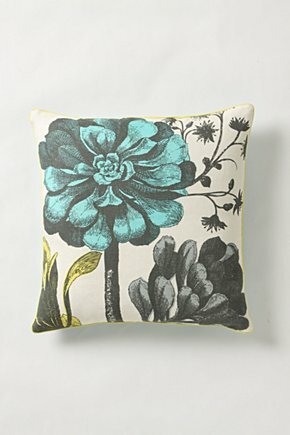 The pillow has a satin finish and is completed with embroidered scalloped petals. 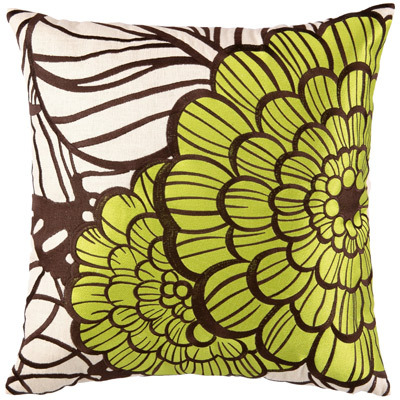 This pillow comes in numerous colors but we are just adoring chartreuse as of late. A spot of tea. How appropriate! We can drink this on settee number 1. 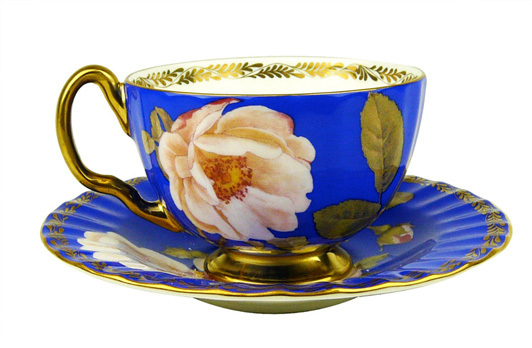 We absolutely love any tea cup and saucer and I don't know many girls that don't. This one has beautiful gold details with a gorgeous floral graphic. Gorgeous, dahling. Gorgeous. Ummm, so who knew that Vera Bradley got into rug making? We certainly did not. This was like striking gold. She has so many fun prints and they are all wool pile. Good quality. 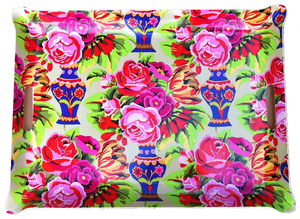 The brightness of this floral pattern is so striking against the black background. Va-va voom. This chair is positively the most comfortable chair. 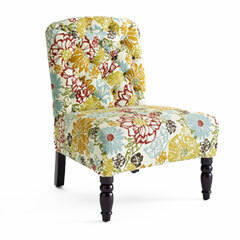 World Market has been carrying this style of chair in a variety of colors and patterns. And well folks, this one gets our vote. Obviously a fun shape, but finished off with a bright whimsical floral print. 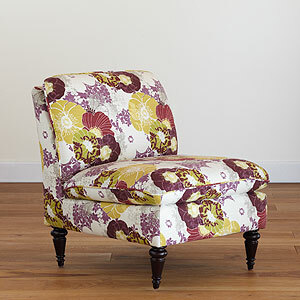 This chair would be perfect in an office, little girls room, living room...Possibilities are endless. Oh the signature Furbish Studio decoupage tray. This print is beyond for us. The girly floral is balanced off with the splashes of the cobalt blue vases. This would be perfect in any room to hold knick knacks and patty whacks. Lovely colors and graphics on this pillow. This could honestly fill any space. It would look lovely against a loud floral print, another graphic or even a solid. So versatile. Again with the fun floral against the dramatic black background! Anthropologie! You get us everytime! This is a fab lumbar pillow that would be great ANYWHERE! Yes. You heard us. Anywhere. Put it in your garden, your dog house. I don't care. Let it be seen! Another home run Vera rug. When I saw this rug, I immediately thought sunroom. For those of you who are lucky enough to have a sunroom in your abode, this rug shall be yours. We S+S girls love us some coral, and this rug is no exception to that rule. Tufted floral chair? Um, yes. Please. Beautimous watercolor duvet cover. This seriously looks like art! On your bed! This would be perfect for any guest bedroom. 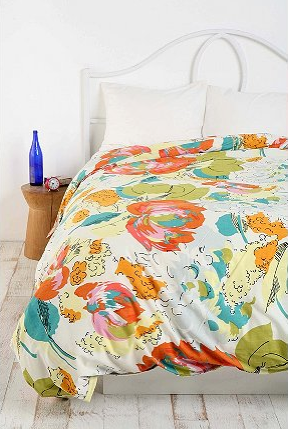 so i was saving up to buy that watercolor floral duvet from urban outfitters and they aren't selling it anymore! :( i'm trying to find it anywhere else tell me if you can help, thanks!